Mt. Mainalon above the village of Kardara. I spent the first three weeks of June in Greece, working with the Mt. Lykaion Excavation and Survey Project. Although the project last conducted fieldwork at the Sanctuary of Zeus Lykaios on Mt. Lykaion in western Arcadia in 2010, we have been busy every summer since then studying the excavated materials. In excavation years, we rent private houses in a village close to the site; during study seasons, we stay in an off-season ski resort in eastern Arcadia, in order to be close to Tripoli, where the artifacts are housed. From Kardara it’s a thirty-minute van ride to our apotheke, or storeroom, where we study the materials almost every day (but never on Sunday). The study seasons witness a wide range of scholars and specialists coming and going as their schedules permit; among others, we have experts in animal bones, roof tiles, coins, and numerous varieties of ancient pottery, including Neolithic, Early, Middle and Late Bronze Age, Iron Age, Classical, Hellenistic, and Roman. Of course, this study could not proceed without the heroic efforts of our registrar, who is responsible for the organization of the apotheke and all procedural matters relating to the artifacts, along with her team of assistants, who do whatever assisting needs to be done. At work in the apotheke. This season I have been assisting one of the project’s directors in the study of the Late Bronze and Early Iron Age pottery, as well as preparing a final report on the stratigraphy of one of the project’s trenches on the peak of Mt. Lykaion. One of my goals this season has been looking for matches or “joins” between the tens of thousands of broken pieces of pottery from the trench. Although it is inherently satisfying to find such joins, a successful outcome is by no means guaranteed; it’s like playing a puzzle without a box-top picture to compare to, and with most, if not all, of the pieces missing. Despite the frequent frustration, it’s an important activity; knowing if there are pieces of the same pot scattered in different parts of the trench helps us to understand the formation processes of the site. If ancient people deposited a whole pot on the mountaintop, but we find broken pieces of it in different areas of our excavation, we deduce that it must have been broken and had its pieces scattered by one or more subsequent events. These events might be later human activity, animal disturbance, natural phenomena like earthquakes or frost heaves, or some combination of these. Given that the altar where we excavated has evidence for human activity spanning some three thousand years or more, from the Neolithic to the Hellenistic period, or from before 3000 BCE down to the 1st century BCE, followed by the two thousand years from then to now, it’s not surprising that things got so mixed around! Beauty isn’t everything at the Kelsey Museum of Archaeology; we value all evidence of life in the ancient world, even when the object is, erm, ugly. This month’s ugly object is an Aphrodite figurine made from copper alloy (aka bronze). Figurine of Aphrodite. Bronze. Late 3rd century AD? KMA 10888. Before treatment. I would never argue that Aphrodite herself is unattractive, but this figurine has seen better days. It was severely corroded when excavated at Karanis, Egypt, in the 1930s, and the legs were in pieces. Sometime after excavation, the corrosion patina was stripped with an electrochemical treatment that was once popular for archaeological metals. This resulted in a dull, brown, pitted surface with multiple holes. Fast forward to 2015, when this object was chosen for a special exhibition. We wanted to reattach the feet and other fragments, but the latter are very thin pieces of metal from the fronts of the legs. They did not attach well to the upper thighs, each other, or the feet, and they could not support the weight of the torso. Our solution was to make prosthetic legs for the Aphrodite, legs that would support the torso and to which the metal “skin” fragments could be attached. I was the conservator for this treatment, and I began by masking the metal surface with Parafilm, a plastic paraffin wrap that is used as a sealant in labs. This protected the metal surface as I worked with the object. Next, I formed new legs with a two-part epoxy putty. At top, the surface is being masked with Parafilm. In the lower image, epoxy putty is being shaped for the left leg. I shaped the new legs one at a time by pressing them into the voids in the upper thighs and placing the feet and other fragments into position on the putty while it was still soft. Once it had cured, I removed the putty from the figurine and the metal fragments from the putty. I then painted the white putty and sealed all the join surfaces with a conservation sealant. Next, each leg and its fragments were glued into place with a conservation adhesive. At left, the glue is setting for the finished left leg. At right, the right leg is being shaped in place on the figurine. 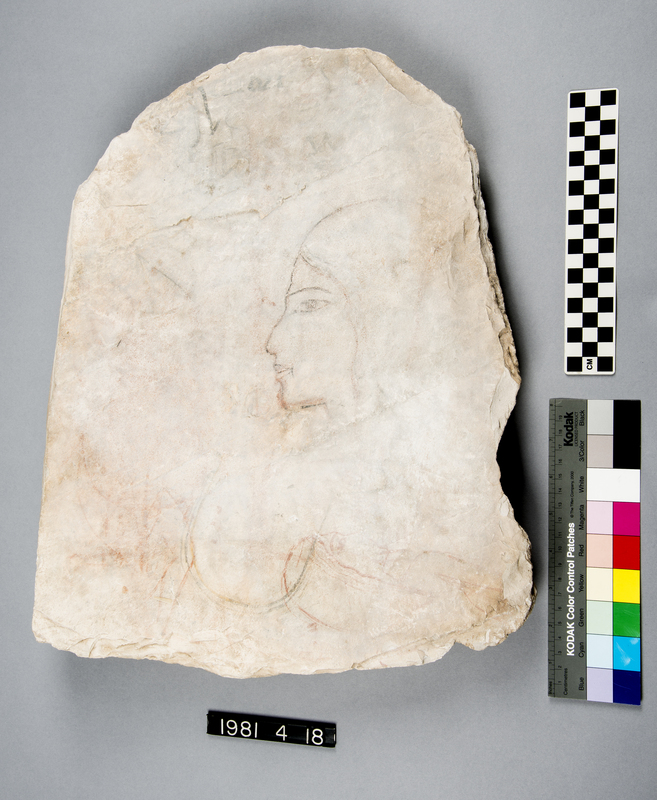 We conservators like this object because it looks very real to us. This Aphrodite is almost 2,000 years old, and she is not lying about her age. In most museums, we see perfect examples of objects like this one. But in the field, on a real-life excavation (or at the Kelsey! ), an object like this Aphrodite is incredibly special, even though it’s not perfectly gorgeous. Figurine of Aphrodite, after treatment.